The Conference is presented as a three-day event at the Inn at St. John’s in Plymouth, Michigan. We have devised a number of registration options to accommodate your particular interests. You may purchase a 3-day, 2-day or single day registration tickets. Payment for Registration fees can be by credit card or by check. Early Bird rates are good through October 12th. Includes all plenary and breakout sessions (THURSDAY, FRIDAY and SATURDAY), breakfast and lunch each day, Thursday evening VIP Reception and Friday evening dinner and performance of Every Brilliant Thing. Pay by Check or Credit options available. Includes all plenary and breakout sessions (THURSDAY and FRIDAY), breakfast and lunch each day, Thursday evening VIP Reception and Friday evening dinner and performance of Every Brilliant Thing. Includes all plenary and breakout sessions on THURSDAY ONLY, breakfast and lunch and Thursday evening VIP Reception. Includes all plenary and breakout sessions on FRIDAY ONLY, breakfast and lunch and Friday evening dinner and performance of Every Brilliant Thing. Includes all plenary and breakout sessions on SATURDAY ONLY, breakfast and lunch. Registrations cancelled less than 60 but more than 30 days before the event will be refunded 25% of the registration fees. Thurs and Fri (including play) – 15.5 credits. PSYCHOLOGISTS – Henry Ford Hospital is approved by the American Psychological Association to sponsor continuing education for psychologists. Henry Ford Health System maintains responsibility for this program and its content. This educational activity is approved for 13 credit hour(s) for psychologists. LICENSED COUNSELORS Continuing education credits approved by the National Board for Certified Counselors.Approval No: SP-3167. 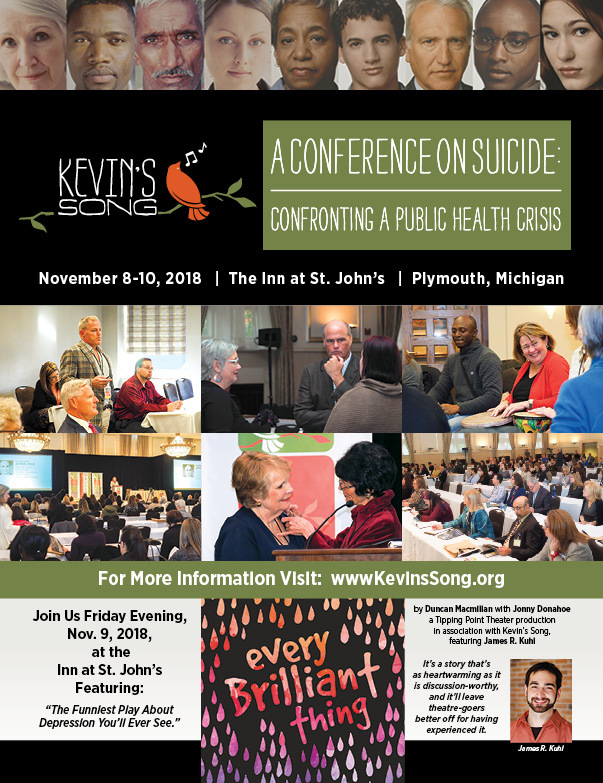 Kevin‘s Song will be offering an app for your use and convenience – before and during the 2018 Conference on Suicide. The Kevin’s Song Conference app will be accessible on smartphones, tablets and laptops through a web browser like Safari, Chrome or Firefox. Simply enter the unique URL for the event. Kevin’s Song will be promoting this URL. Despite accessing the app like a website, your app actually functions offline too. The Kevin’s Song Conference app will be available in all 4 app stores as well. When you register, you will receive an email with information on downloading the app. You will be able to download the app for Apple, Android, BlackBerry and Windows Phones. The app is a great way to view the conference agenda, customize your conference schedule, stay up-to-date with alerts and notifications, engage with other attendees and submit your conference session evaluations. The Inn at St. John’s is Metro Detroit’s fourth largest hotel with conference center and golf course in terms of total meeting space. Located in Plymouth, MI, this breathtaking landmark is the premier location for luxury hotel accommodations, gourmet dining, golf outings, corporate meetings and special events. We have a special room rate of $149.00 per night for people coming to the conference.